The underlying story of The Creeping Flesh is fascinating. The possibilities that arise from this ancient advanced being that could be a source of real physical evil makes from some cosmic tinged horror. 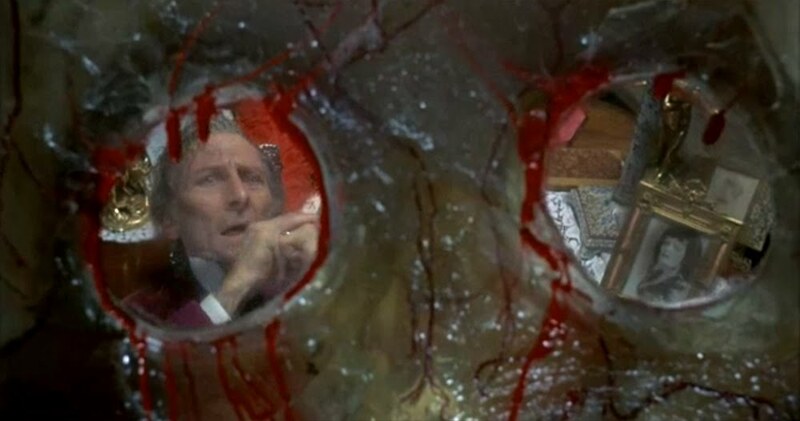 While the film never becomes directly Lovecraftian, it does draw a little bit from that well of vast dread. I can see this movie having some influence on Alien (1979) by opening its mystery with an oversized and distorted skeleton. I also see a touchstone for Prince of Darkness (1987), with a long forgotten source of human evil that is on the verge of awakening to herald the end of the world. "Oh, I really hope that this is a finger..."
It’s shame this wonderful premise gets sidelined for a much less interesting, although probably much much more cost effective subplot involving Dr. Hildern’s daughter, Penelope. Penelope is a recipient of a ‘vaccine against evil’ that of course goes wrong, turning her into an amoral monster who casually murderers on a whim. Watching Penelope’s descent at the hands of her well-meaning father isn’t dull, but the whole story dominates the central part of the film. If the plot could keep the evil skeleton narrative simmering in the background with more skill, this would work just fine. However, it feels like that element is dropped for too long. There’s a notable rise in the energy of the film when it finally turns back to it's original question for the finale. 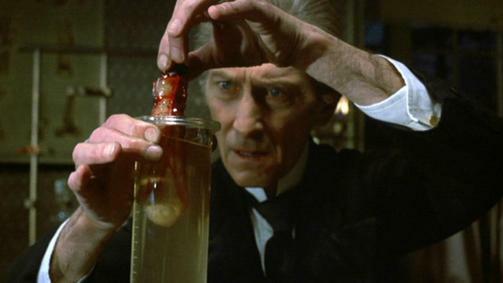 As always, Peter Cushing turns in a tremendous performance as a man caught between his research, protecting his daughter (and himself) from the truth of a tragic past, and a not so hidden rivalry with his brother. Christopher Lee has limited screen time here as Hildern's brother, but he makes the most of it, layering on a sinister graciousness. Lorna Heilborn makes Penelope’s change from innocent and distraught girl to psychotic murderer work by demonstrating just how much joy inflicting pain brings her. The film looks great, filled with gloomy autumn images, and dark claustrophobic interiors. Director Freddie Francis does an amazing job of making the ambulatory skeleton look menacing, mostly by concentrating on its looming shadow as searches for its target. There is a very limited about of gore on display, most of the titular creeping flesh is rendered in stop motion and a few simple prosthetics. This was the last film made by Tigon, a British film company that produced a number of notable horror films, such as The Blood on Satan’s Claw (1971) and Witchfinder General (1968). While it is not up to the standards of those two films, The Creeping Flesh is very enjoyable in its own right.